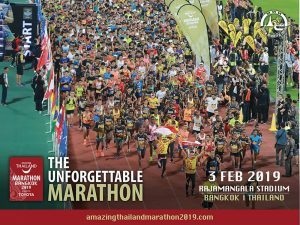 Over 25,000 runners from all around the world are set to return for the second edition of the “Amazing Thailand Marathon Bangkok 2019 presented by Toyota”, which is scheduled for Sunday, 3 February, 2019. Launched by the Tourism Authority of Thailand (TAT) and Thailand Tri-League in cooperation with strategic partners in the public and private sector, the inaugural “Amazing Thailand Marathon Bangkok 2018 presented by Toyota” was held successfully on 4 February, this year. On Sunday, 3 February, 2019 marathon runners will start their race from Rajamangala Stadium, while half-marathon and 10 km. participants, including the wheelchair racers, will begin their day near the Loha Prasat of Wat Ratchanatdaram. Family runners are to start in front of the Ministry of Agriculture and Cooperatives.